The name of the Houthis is attributed to the Yemeni Shiite cleric Badr al-Din Amir al-Din al-Houthi (1926-2010), who was known for his tendency to take over the ruling on religious bases and not to recognize the republican system. In 1986, he established the so-called "Youth Union" along with his companion, Majd al-Din al-Mu'aydi (1914-2007), through which he aimed to present the Twelver doctrine (Ithnaashariyya) based on the theory of the Wilayat al-Faqih. He presented himself as the "Al-Wali al-Faqih”. This was the reason for the disagreement between him and his companion, who considered himself as the leading Imam, according to the theory that the Zaidi symbols reached to come out of the dilemma of the obligation that the imamate must be from the two tattoos (in reference to relatives of Prophet Mohamed from his daughter Fatima). The dispute between al-Houthi and al-Mu’ayidi resulted in split of (the Youth Union), as al-Mu’ayidi withdrew from the union with many of comrades and supporters. With the reestablishment of unity between the two parts of Yemen, northern and southern Yemen, in 1990, Badr al-Din al-Houthi instructed his eldest son (Mohamed) to establish the Youth Believers Forum along with one of his students (Mohamed Salem Azzan). The forum exploited the freedom space that has become available after the Yemeni unity as the constitution allowed the formation of political, intellectual and cultural organizations. The new organization was able to circulate the Twelver ideology (Ithna’ashariyya) – that the eldest Houthi (Badr al-Din al-Houthi) dreamed to promote in the Zaidi areas since a long time - within seven years from 1990 to 1997. The Houthi movement managed to establish their first cultural camp in the city of Saada, the most zealous governorate for the Zaidi belief and its cultural and intellectual stronghold. This move aroused the anger of the political Hashimiyya that saw this organization as a danger to its existence because it is based on the theory of Khomeini called “Wilayat al-Faqih.” The symbols of the political Hashimiyya wanted to refute this thought through their senior references, including Majd al-Din al-Mu’ayidi, Mohamed Mohamed al-Mansour and Abbas Al-Moayad, and other symbols of the political Hashimiyya. When differences between the two groups escalated and began to appear in public, after it was behind the scenes in order to preserve the rationalism structure from fragmentation, the political symbols of the political Hashimiyya, including Major General Yahya al-Mutawakil, Dr. Ahmad Sharaf al-Din, Dr. Mohammad Abd al-Malik al-Mutawakil, and Ahmad al-Kohlani, intervened to reach an agreement to contain this dispute and former President Ali Abdullah Saleh witnessed the agreement, in light of which the Houthis were given annual financial support for their activities in return for their commitment to the principles of the Zaidi doctrine. During the signing of this agreement, Badr al-Din al-Houthi and his descendants Hussein, Abd al-Malik and Abd al-Khaliq were living in Iran since they fled the country following the outbreak of the summer war in 1994 because of the Houthi support for secession between north and south and the Houthi allegiance to Ali Salem al-Baid, whom Houthis see as member of the Hashimi family. The man and his three sons stayed in Iran for almost seven years and comprehended the doctrine of Twelver, Ithna’ashariyya. They returned to Yemen after a special amnesty in 2001, mediated by the symbols of the political Hashimiyya. After the return of Badr al-Din and his sons to Yemen, Hussein Badr al-Din al-Houthi took control of the organization of the Youth Believer (Al-Shabab al-Mu’min) and managed to exclude his brother Mohamed and also Mohamed Azzan from the leadership of the organization. So, Hussein al-Houthi began to present the Twelver belief explicitly in his lectures and seminars, under the name of antagonism against America and Israel, and then we can say that the organization of the Youth Believer (Al-Shabab Al-Mu’min) has become an Iranian revolutionary organization. Al-Shabab Al-Mu’min increased behind the new leader of the Houthis encouraging him to declare the rebellion against the state in 2004, which ended within a few days. But the rebellion quickly reorganized ranks under the leadership of his brother Abdul-Malik, who fought against the state other five wars ended in the sixth war in 2009. During wars, the Houthis received material, military, political and media support from Iran and the Lebanese Hezbollah. During the Youth Peaceful Revolution that broke out within the Arab spring revolutions, the Houthis managed to take over the entire governorate of Saada exploiting the glare of the Arab spring revolutions and the regime's busyness with the suppression of the revolution. They participated in the peaceful revolution’s squares, and at the same time they expanded militarily in the provinces of Al-Jawf, Hajjah and Amran. After the fall of Saleh's regime and the transfer of power to President AbdRabbo Mansour Hadi 2012, the Houthis participated in the National Dialogue Conference along with other peaceful political and revolutionary organizations, and from that time they called themselves a new name (Ansar Allah). In 2014 and in an alliance with both the former President Ali Abdullah Saleh and the organization of the political Hashimiyya, the strategic ally of Saleh, the Houthis could invade the province of Amran and then the overthrow of the state and the takeover of power in Sanaa, and then began to wage war against the southern provinces to have control over most of the governorates until the beginning of the Deceive Storm, led by Saudi Arabia, in March 2015. At the end of 2017, the Houthis managed to kill their ally, former President Ali Abdullah Saleh, after the siege of his home in Sanaa for two days. As for the historical roots of the political Hashmiyya, it extends to more than a thousand years, the age of the Imamate rule in the northern North Yemen on the basis of a religious political theory called (theory of al-Batnain). 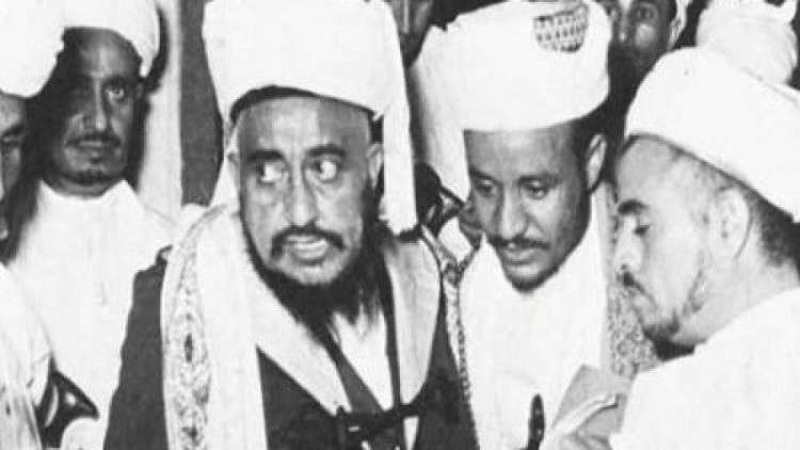 Al-Hashimiyya got an overwhelming defeat in Yemen following the outbreak of the revolution of September 26, 1962 by the rebels against the rational Imamate rule. However, it continued to resist and fight for the restoration of the Imamate rule against republicans who were supported by President Jamal Abdel Nasser in Egypt. The war between the republicans and the monarchs (the political Hashimiyyab) continued until 1970, which witnessed reconciliation between the republicans and the monarchs under the auspices of Saudi Arabia and Egypt, where the agreement led to the inclusion of the political Hashimiyya in the government under the umbrella of the republican system. Following the agreement, the monarchs (the political Hashimiyya) in Sana'a formed a special secret organization aimed at restoring the rational rule through penetrating the civil and military institutions of the state through a long-term strategic plan that ends with the seizure of power even under the umbrella of the republican system. The secret organization moved on twoards its objectives and it was almost to achieve the objectives but the sudden appearance of the Houthi group and the outbreak of the Arab Spring revolutions broke the road. Al-Hashimiyya is based on the theory of the "Imamate of Al-Batnain" in the sense that it should be the ruling on the offspring of Ali Ibn Abi Talib from Fatima, the daughter of the Prophet Mohamed. This means that the rule should be for the descendants of Hassan and Hussein, the sons of Ali. At this point, the political Hashimiyya agree with the Twelver (Ithna’ashariyya), which the Houthis adopt and promote, but they differ in the details explaining this theory. At the time when the Hashemiyya believes that the rule should be limited to the descendants of Hassan and Hussein, the Houthis believe that that the rule should be limited to the descendants of Hussein only, without Hassan, who the Houthis say voluntarily handed over the power to his opponent Muawiya. This idea of Twelver makes the political Hashemite ineligible for the rule as all Hashemite imams who ruled Yemen over the past one thousand years were the descendants of Hassan bin Ali. This intellectual dispute between the two parties made each party claims that the other is disbeliever. After the fall of the rule of the Imamate (the political Hashemite) in Yemen because of the revolution of September 26, 1962 and then the agreement between Republicans and monarchs in 1970 and the end of the war between them, the political Hashimiyya became in a big intellectual dilemma that caused a major disintegration in the ranks, how they can accept to live under a political system that is not subject to their theory (The rule of Al-Batnain). The symbols of the political Hashimiyya, on top of them (Majd al-Din al-Mua’yadi) agree on the need to develop a new intellectual theory along with the lines of Khomeini's theory (the mandate of the jurist). In the early 1980s, during the reign of Ali Abdullah Saleh, the new theory of (Imam al-Qa`ad and Imam al-Qa'im) came out. The theory accepts the rule of a person from outside the baton and to swear allegiance to the president (Imam al-Qa’am) with allegiance to another person to be (Iamam al-Qa’ad). Majd al-Din al-Mua’yadi was selected to be the Imam al-Qa’ad and he continued to be the leader of the political Hashimiyya in Yemen, Najran and Hejaz until his death in 2007, in addition to his membership in the Supreme Council of Al AlBait Wise Men in Yemen, the political secret of the political Hashimiyya. Although Badr al-Din al-Houthi is also a descendant of Hassan ibn Ali, his ambition to take the Imamate and his extreme hostility to his most prominent rival, Majd al-Din al-Mua’yadi, made him falls in the arms of Iran and adopts the Twelver ideology. He presented himself to the Iranians as the "Yamani" who will help in facilitating the appearance of the upcoming Imam, according to Twelver belief. In the Twelver faith, al-Yamani is a Yemeni man descending from Hassan bin Ali who will take over the rule in Yemen and his takeover represents an introduction to the appearance of the upcoming Imam. This is one of the reasons why Iran supports Houthi alone, in addition to achieving its strategic, geographic and political objectives through supporting rebellion movements in Yemen and other countries. The intellectual conflict between al-Muayidi and the Houthi caused ideological conflict between the political Hashimiyya and the Houthi movement. The conflict pushed the religious symbols of the political Hashimiyya to issue a number of fatwas supporting the regime of Saleh during his war against the rebel group of Houthis in Saada, but this conflict began to decline after the death of Majd al-Din al-Mua’yidi and the inability of the political Hashimiyya to choose another one to be the Imam al-Qa’ad because of the fierce competition between the symbols of the political Hashimiyya. This brought them back to the same intellectual vacuum, but their secret political organization remained largely cohesive. This intellectual vacuum was an opportunity for the Houthi movement. Badr al-Din al-Houthi returned from Iran to present himself as a new imam and led many wars alongside with his son, Abdul-Malik, but he (Badr al-Din) soon died in 2010 from injuries he sustained in the last war with Saleh's regime in 2009. Al-Hashimiyya found its path to play a political role via Ali Abdullah Saleh. It exploited Saleh’s passion for power and his desire to bequeath the power to his family and allied with him through one of its political figures. For his part, Saleh facilitated the political Hashimiyya infiltration into the state's military and civilian institutions. He placed many of their sons in the Republican Guards and the Central Security Organization, and gave them leadership positions in the government and the judiciary and in his own political party, which provided a strong political cover and a large military and civilian authority to the Hashimiyya, while at the same time the Houthis in ongoing wars with Saleh's regime enabled them to expand and spread in the province of Saada. After Yahya al-Shami took over the leadership of the secret organization of the political Hashmiyya and because of his tendencies to the alliance with the Houthi movement, the two organizations began to harmonize. This encouraged many Hashemites to begin showing compassion for the Houthis. Since the transfer of power to President Abd Rabbo Mansour Hadi in 2012 through the GCC Initiative, the political Hashimiyya provided the Houthis with political organizational expertise and it could convince them to establish a political office and rename their group (Ansar Allah). From this point, the two organizations began to move towards one goal - to take over the power by force- especially after Saleh left the power due to the February Revolution 2011. Thus, the political Hashimiyya has thrown its political and organizational weight in favor of the Houthi movement and contributed greatly to supporting the coup in partnership with former President Ali Abdullah Saleh. During the years of the coup, the political Hashimiyya realized that it had fallen into a serious dilemma in its alliance with a vengeful person and a reckless one. This itself threatens its strategic project to restore power. The political Hashimiyya felt that it had become a socially and regionally rejected group because of the barbarism of the coup alliance. The Houthis to kill Ali Abdullah Saleh, which was a political cover for the Hashimiyya political safe cover for resettlement in the event of disposal of the Houthi movement and the failure of the coup. The political Hashimiya feels it is exposed to danger because part of its leadership is foolishly lenient with the Houthi project, such as brigadier Yahya al-Shami. It has become aware that this identification with the Houthis may cost a heavy price in case the Houthi armed movement is defeated in the war led by the Arab Coalition since March 2015, and may lead to the fragmentation and collapse of the two movements, the Houthi Iranian Revolutionary and the Political Hashimiyya. It seems that the best and most accessible scenario for the political Hashimiyya now is the urgent response to the lines of communication that have been secretly opened by the Gulf neighborhood in exchange for abandoning the Iran-related Houthi revolutionary movement and conducting political dialogues leading to the rescue of the Hashimiyya organization from the deadlock of the Houthiyya as another scenario within several expected scenarios.